In the spirit of Cube, but this time with (maybe?) aliens choosing the subjects instead of (maybe?) the government, Circle is a social/survival experiment where most choices lead to your immediate death and only the ruthless will survive. A simple metaphor for modern life? Sure, but there’s more to experience while watching this film than just the surface theme. Circle takes on a variety of social, racial, & economic issues in its 80 minutes, spinning a bare bones story where each line has been crafted to make a great point. Sounds too good to be true perhaps, especially coming from a low-budget indie film, but Circle craftily nails more sensitive targets within its short span than most Hollywood hits could even dream of. Curious yet? Fifty strangers wake up from similar blackouts only to find themselves in a black room. 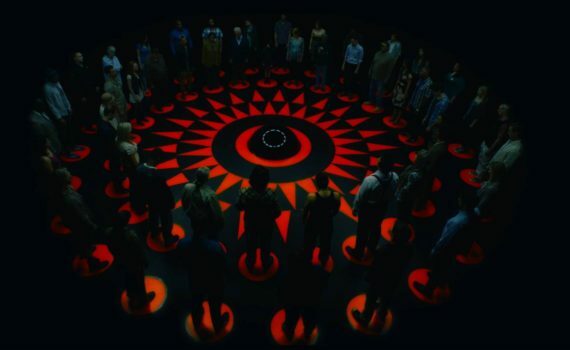 They are arranged in a circle, each with a red triangle on the floor pointing directly at them, each standing on a small highlighted disc. A dark orb watches from the center and seems to see everything, even the tiniest motions of hands. Step off your disc and you die. Touch someone next to you and you die. Sit down and you die. Death hangs in the otherwise empty darkness like a shroud, ready to wrap around each of the fifty in turn. Why are they here, where did they come from, who brought them into this place, and how do they leave? More questions that answers, and time is running out. Every two minutes a series of sounds plays out and a bolt of electricity kills one random victim. Except, as time goes by and the standers begin to talk to one another, calming their initial state of panic, they realize that the deaths don’t have to be random. By moving your hand you can select one person among the circle, with whoever receives the most votes also receiving the sentence. One by one the group chooses who will die, but on what basis? Age, ethnicity, production in society; factors are voted on, found lesser than, and used as determination to kill. But as the group grows smaller, deceit & betrayal rear their ugly heads, leading to an outcome that can be nothing but evil. Someone sure wasn’t afraid to say what makes the rest of us uncomfortable. And given the setting, death waiting right around the corner gives us all a perfect opportunity to speak our minds. After all, we, like those in the circle, won’t live forever, and in the end it’s our own lives that we cherish most. So, stripped of pretenses, real thoughts emerge. Haven’t old people lived long enough to surpass their usefulness, shouldn’t people of the same color stick together no matter what, can’t we judge a person’s worth by the amount they have benefited those around that, don’t your mistakes in life make you less valuable. These are a few of the ideas broached by members of the circle, as their fear to insult & alienate disappears behind their self-preservation. Racism, sexism, ageism, and classism abound, as each belittled party fights against those who might vote for their deaths. It’s heavy stuff, thrown out like it’s litter, but made all the more impactful by the flippancy with which it’s treated. What would you do or say to survive, who would you put under you, and who would you die to save? More questions than answers, like I said, and the film forces thought through each vote even when you’d perhaps rather abstain. Circle packs the points in tight, demands that you stand there to listen, and never apologizes; something worth time in my book. The film itself takes place in one dark space, the actors barely move, and hardly anything changes, and yet I was drawn to the screen because I knew I couldn’t miss one bit of dialogue, one deciding factor in what was quickly becoming a depleted playing field. The run time of the movie is the run time of the game, making us a part of the action, and hooking us in to what is truly a desperately terrible situation. Sound fun? Video – With an aspect ratio of 2.35:1 (16×9),the audio quality of Circle is top-notch, with a nice balance between crisp images and the obscurity of the dark. The action takes place in the middle of black space, with a few lights overhead. There isn’t action or even much movement to depict on camera; what video quality there is goes toward the clarity of the images and the use of color. Audio – The DVD was done in 5.1 Surround with an option of 2.0 Stereo. Also, audio commentary with Mario Miscione and Michael Nardelli can be selected in the audio menu. Not much in the film demands strong audio, and there’s little to no music, just a few effects. Extras – There are two special features in the menu; a behind-the-scenes featurette and a trailer for the film. Highly Recommended. 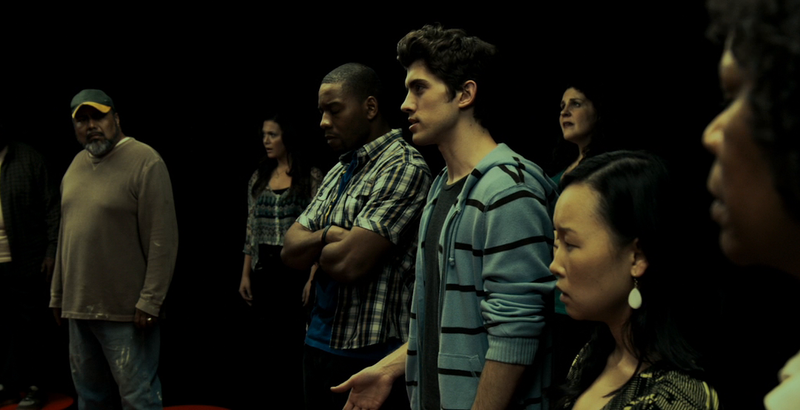 With cutting critique and a simple death trap setting, Circle succeeds by not trying too hard. It puts fifty people in a room, asks that they eliminate each other, and then stands back to watch it happen. The choices that are made on camera seem like they’re being made in real time, and the film as a whole is depressingly realistic, at least in its result. A cool sci-fi vibe that acts as a vehicle for social commentary, Circle has flown under the radar for too long and demands to be seen. The video is very nice, the audio untapped, and there are two extras on the DVD. Watch for a distinct point of view and for, possibly, and opening of your eyes.